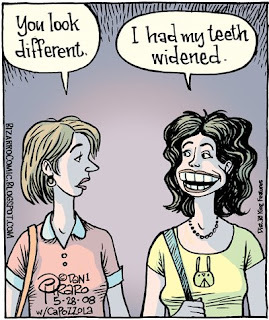 Today's Bizarro cartoon is brought to you by Vapid Pursuits Plastic Surgery Partnership. 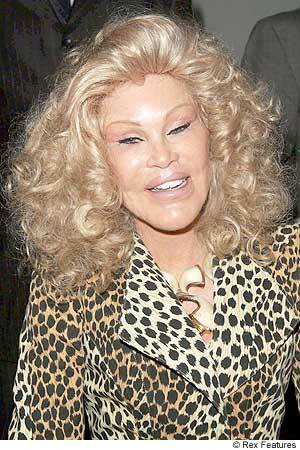 "Making millions from poor self esteem since 1976." This idea was donated by my friend and fellow cartoonist, Michael Capozzola of Cheap City. I like it because I dislike this current trend of making one's teeth as white as the underwear on a Tide commercial. In contrast, my teeth, which are a fairly normal color, look like rotting Cheetos. I'm afraid to smile around the luminous-mouthed people I know, for fear they will think I'm homeless, or British, or worse. I can't afford to use an overly large pulpit on this point, however, as I did recently endure five years of adult braces. I'm ashamed now that I was vain enough to go through with it. I had learned to live with my slightly crooked teeth until my new girlfriend at the time (1998) convinced me they were unattractive and I should get them fixed. I began to feel self-conscious and gave in, not fully realizing the physical pain, constant irritation and inconvenience that lay ahead. It was five long years of complete misery, not to mention thousands of dollars out of my own pocket for the honor. CHNW would never have even thought of making such a suggestion. Now that they are gone and my teeth are fairly straight (I had them removed before the orthodontist recommended because I was just flat sick of them) I suppose it is fine, but if I had it to do all over again I would have skipped it. Girlfriend be damned, it's not like I was a snaggletoothed hillbilly or anything. I won't get my teeth whitened, either, so deal with it. Hmmm. The one on the right somehow ended up with Condi Rice's mouth. But Simon Cowell is British, and he has the whitest teeth of all! >ended up with Condi Rice's mouth. Simon Cowell also owns a million dollar car. Vain much? this is the first thing i thought of when you mentioned just how unnecessary braces are. i was a metal-mouth for only 2.5 years, but mine were necessary because my canines would have grown out from the roof of my nouth... my boyfriend had them for 8 years.. imagine getting braces in 5th grade knowing you'll be graduating high school with them. yea.